As promised a couple weeks ago, I’ve created a tutorial for automatically installing Let’s Encrypt certificates on Vesta-hosted sites. As you’ll recall, Let’s Encrypt is a new certificate authority that issues free domain validated (DV) certificates to virtually anyone in an effort to make the web more secure. Let’s Encrypt tries to be fully automated, meaning that you just run a single command on your server and it takes care of all the details of certificate issuance for you: creating the private key and CSR, validating domain ownership, generating the cert, and even configuring the web server for you. Unfortunately, Let’s Encrypt and Vesta use different naming conventions for the certificate files, so the two don’t automatically play nice together. Thanks to Vesta’s command-line tools, however, it is pretty easy to bridge the gap. TL;DR version: I’ve created a tool, which I’ve posted to GitHub, that automates the Let’s Encrypt certificate request and installation process using the Let’s Encrypt ACME client and Vesta’s command-line tools. You can clone my repository and get to work installing certs on your server. You should be logged in a root to complete this tutorial. The Let’s Encrypt client requires Python 2.7, which is not installed on CentOS 6.x by default. Simply upgrading Python will break several system utilities, like yum, so we’ll start by installing Python 2.7 in an alternate location. If you’re using a distro that includes Python 2.7, or you already have it installed, you can skip the next several steps. First, using yum, install the development tools and libraries we’ll need to build Python from source. Download the latest version of the Python 2.7 branch (2.7.11 as of this writing, but check http://python.org/downloads/ and update the version numbers as appropriate. Unzip the Python tarball and change into the newly create source directory. Build and install the new Python binary. We’re using “make altinstall” to ensure that we don’t interfere the system version of Python (this will name the binary python2.7 instead of just python). Thanks to Daniel Eriksson and Too Much Data for the How to install Python 2.7 and Python 3.3 on CentOS 6 post, from which my instructions are based. I highly recommend reading that post, as my instructions are only the bare minimum needed to get Let’s Encrypt working. Now that we have the right Python version, we can install the Let’s Encrypt ACME client. We’ll also install my installation tool (which isn’t much more than a bash script). /usr/local is intended for locally installed software (as opposed to system provided software), so it seems like a good place to put these tools. Clone the official Let’s Encrypt ACME client and my installation tool from GitHub. Let’s Encrypt’s ACME protocol validates that a requestor is in control of the domain by checking for a the availability of a randomly named file over the web. It can do this with its own web server, or it can write a file to the web root of an existing server running on the domain. Since a Vesta server has many different web roots, we’ll tell let’s Encrypt to write these files to a central location and then configure Apache to look there for incoming validation requests. First, create the Let’s Encrypt webroot directory. Then create a symlink to the letsencrypt.conf file in my GitHub repository. Finally, restart Apache so it will pick up the configuration change. Everything is installed and ready to go, but to run the tools you’ll need to specify the full path to them, since they aren’t in your PATH environment variable. A quick fix for this is to symlink them inside /usr/local/bin. Now you’re ready to create your first certificate. Substitute a valid Vesta user account for USERNAME and a domain hosted on that account for DOMAIN. The script will look up the account and pull the email address listed with it, using that as the contact email used in the certificate request. It will also look up the list of domain aliases associated with the domain and will include all of them as subject alternate names (SANs) in the certificate request. SANs function as additional domains on the certificate—each one will be recognized as a trusted domain by users’ browsers. The first time you run the script, the Let’s Encrypt client will do some setup work, so it may take a minute or two. Future runs won’t require this additional work and should complete faster. The certificates issued by Let’s Encrypt are valid for 90 days. It is recommended that you renew them every 60 days to allow ample time to mitigate issues such as reissue errors and service interruptions that might occur and leave you with an expired cert. Let’s Encrypt is currently in beta and, while they offer unlimited certificates, they do have some limitations in place, at least for now. As of this writing, they currently only allow ten certificate requests from a single IP address over a three hour period and limit the number of SANs on a single certificate to 100. There are also limits on the number of unverified requests (as in a certificate is requested, but the validation process fails) allowed, though this shouldn’t be ann issue for most admins. These numbers may change over time as the technology platform matures and demand for the service adjusts. This tutorial will help you get GNU Mailman 2.1.x running on a Linux server. It’s geared toward CentOS 6.x, but will probably work with other Linux distros, although some file paths may change. It also assumes a standard VestaCP installation, with both Apache and Nginx running on the server. Before we get too far into this, I should also point out that this tutorial only gets Mailman running on a Vesta server, it does not integrate it with the Vesta web interface. This means that you, as root, will need to set up new lists on the command line—you won’t be able to let your users create their own lists. Once a list is set up, however, it can be completely administered through the Mailman web interface, so hopefully this won’t be too big a deal for most situations. Mailman is available as a CentOS package, but at the time that I did the install, several of the big email providers had recently made changes to their DMARC policies that broke older versions of Mailman, so I chose to build from the then-latest source release, which included new workarounds to address the issue. When I did my installation, Mailman 3 was in beta, I believe, but since it wasn’t yet stable, and since I was moving existing Mailman 2.1 lists, I chose to stick with 2.1. Mailman 3 is now generally available and has some interesting new features, but it’s a significantly different beast and this tutorial probably won’t be helpful if you want to jump to 3.0. Fortunately, Mailman 2.1 is still in support and is still receiving regular updates, with 2.1.20 being the most recent version as of this writing. This tutorial assumes that System V is used to manage services on the server. Many new Linux distros, including CentOS 7, have switched to systemd, which uses a different configuration format. If you’re using a systemd-based distribution, you’re on your own to figure that out, as I haven’t tried to do it yet (with Mailman anyway) myself. While Mailman 2.1 supports multiple domain names, it does not allow the same list name to be used multiple times on different domains. In other words, if you host cats.com and dogs.com on the same server, and you create a customers@cats.com list, you can’t also create a customers@dogs.com list. While this wasn’t really a deal breaker for me, I decided to come up with a work around anyway, taking my lead from cPanel. cPanel appends the domain name onto the list name (i.e. customers_cats.com), but somehow strips it out in the email messages so that users only see customers@cats.com. I couldn’t figure out exactly how cPanel does this, but I came up with a pretty good facsimile by using Exim’s address rewriting features. We’ll start by downloading the latest release of the 2.1 branch of Mailman (2.1.20 as of this writing). Check http://launchpad.net/mailman to be sure you’re using the latest version. If the above script returns any errors (and it probably will), run it again with the -f flag to have it try to fix the errors. In some cases, you may need to do this a few times before everything works. Copy the mailman crontab file to /etc/cron.d so that Mailman’s periodic tasks, such as sending out email reminders of posts awaiting moderation and managing the list archive, are run regularly. Now set a default password for Mailman. This password can be used in place of any list’s administrator password, so be sure to select a strong password. Mailman requires that a default list, aptly named “mailman,” be created. You’ll be prompted for an administrator email address and a list password when you run this command. You can ignore the list of aliases that is displayed when you run the command. The next step in the configuration process is to integrate it with Exim, Vesta’s mail transfer agent (MTA). This allows Vesta to properly route incoming messages sent to a Mailman list to the Mailman software to process them. Exam is actually a preferred MTA to use with Mailman because it’s ability to route messages based on directory listings means that no per-list Exim configuration is necessary. By contrast, most other MTAs require you to set up several email aliases for each list you create. The next several steps require editing the /etc/exim/exim.conf file. To make what’s going on more understandable, I’m going to start at the bottom of the file and work my way toward the top. Then open it to edit. As mentioned above, Mailman does not support lists on multiple domains that share the same name. To work around this, I decided to follow cPanel’s lead and appended the domain name to the list name in the form listtname__domain.tld__. (Note that the trailing double underscore is necessary to properly parse address that contain a command, such as “-unsubscribe.” I couldn’t get the rewrite to properly parse these addresses without the underscores there.) This creates list email addresses that look like listname__domain.tld__@domain.tld which is undesireable. When mail is sent, however, Exim rewrites the email addresses it finds in the message into the preferred form, listtname@domain.tld, so end users see the cleaner form of the address. The above rewrite rule will strip the extraneous domain name from the list name when messages are sent, but only when the address appears in specific email headers. While this ensures that the to, from, and cc headers, for example are rewritten, it does not rewrite some of the more obscure headers, such as those that instruct mail clients how to handle unsubscribe requests. For this reason, we include two transports and two routers, the next features we’ll configure, that will properly route inbound messages that use either address format. Transports that tell Exim how to handle a given incoming message. In this case, the transports instruct Exim to open a pipe to Mailman, when it receives a message associated with a list, through which it will pass the contents of the message, allowing Mailman to take over the processing. Find the line “begin transports,” and add the following lines after this line but before the “begin rewrites” line. There are several other transports already defined. Where you put these doesn’t matter, as long as they’re in the “transports” section of the file. Finally, we create two routers. These tell Exim where to look to determine whether an incoming message has a valid destination on the server and, when a match is found, which transport it should be routed to for processing. Add the following lines to the file between “begin routers” and “begin transports.” Like with the transports, positioning doesn’t matter, as long as both definitions appear before the “begin transports line of the file. Configuring Apache was a bit of a challenge because Mailman is very specific about which user account it runs under. Vesta, on the other hand, uses suexec to run all scripts under the UID of the site owner, which breaks mailman. The solution is to run Mailman on a different port, where it is not bound by suexec’s rules. Later, we’ll set up a proxy in Nginx so that users won’t need to remember complicated URLs to manage their lists. Mailman’s web-based admin tool has several small images at the bottom, which it expects to find in Apache’s /var/www/icons directory. Create symlinks in the icons directory that point at these images. Create a new configuration file for Mailman’s Apache configuration. Add a listen directive at the very top of this file. This tells Apache to bind to port 8090 when it starts and to listen for HTTP connections on this port. Next, add a VirtualHost block to handle requests coming in to this port. Now, depending on your firewall settings, you may be able to access the Mailman web interface at http://domain.tld:8090/mailman/listinfo. If you can’t, don’t worry about it as we’ll set that up next. Next, Nginx needs to be configured on each site to proxy requests to Mailman’s Apache listener on port 8090. Fortunately, we only need to apply this change to a few template files. Vesta offers a tool to reapply the template to a site’s configuration, which is a big help if you already have a lot of sites configured on the server. Vesta stores it’s Nginx configuration templates in /usr/local/vesta/data/templates/web/nginx. This directory contains templates for each of the “proxy templates” you can choose when setting up a hosting package. Files with the extension .tpl are for HTTP configurations and .stpl files are for HTTPS configurations. You’ll need make the follow edits to each of the templates in the directory (or at least each of the templates that you use on your server). We’ll start with HTTPS. Mailman, for the most part, uses relative URLs for most of it’s interface, so it runs fine on both HTTP and HTTPS. The user administration pages, however, use absolute URLs, so when managing users you can be dropped to HTTP unexpectedly. While not a standard module of Nginx, the CentOS builds include the ngx_http_sub_module, which can do string substitutions on page output. We can use this to rewrite the HTTP URLs in Mailman’s output to HTTPS to avoid problems. Save the file and do the same for the other .stpl files in the directory. There are two options for the HTTP configuration. If you know that all of your sites will have SSL certificates, as mine do, you can use the following configuration to direct all HTTP requests to their HTTPS counterparts. I recommend this approach if you can support it. And, like before, repeat the change on the other .tpl files as well. Mailman is now up and running. All that’s left to do is to start creating lists. When setting up a new list, remember that it is necessary to use the full address syntax, listname__domain.tld__@domain.tld for the list address. You should also specify both the emailhost and urlhost options to ensure that the list is configured correctly. You’ll be prompted for an email address of the list administrator and for a list password. When the list is set up, you can access it at http://www.domain.tld/mailman/admin/listname__domain.tld__. Since, through the Exim rewrites, we’re running the list from a different address than we configured Mailman to use, it is necessary to make one small settings change to the list’s settings. Open the list’s administrative page in a browser and log in with the password you provided in the previous step. On the Recipient Filters page, find the field labelled “Alias names (regexps) which qualify as explicit to or cc destination names for this list” and add the preferred list address (listtname@domain.tld). Without this, Mailman will not recognize the preferred address as being a valid list address and will hold any messages that are sent using it for moderation. Click the “Submit Your Changes” button to save the change. Then make any additional settings changes you require and add recipients to the list under “Membership Management” in the “Configuration Categories” menu. You’re list is now ready to use. OK, so you have a Raspberry Pi running heedlessly (no keyboard or screen) on your network and you want to do something with it. What do you do? Well, there’s SSH, of course, but what if you want to play with any of the Pi’s graphical tools? The Raspbian OS (as well as most of the other general-use OS options available on the Raspberry Pi site) runs an XWindow service by default. 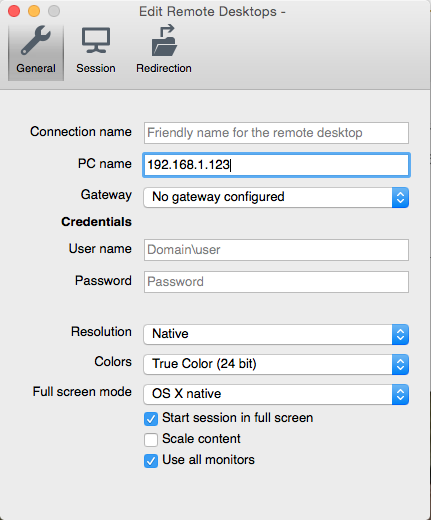 This provides the GUI when the Pi is plugged in to a screen, but it can also be accessed remotely. This post will look at some of the several ways to do this. TL;DR version: most of these examples are either too difficult to set up or too impractical to use reliably. For a no-nonsense tutorial on a tool that works pretty well, jump straight to the last section, XRDP. You should see a window open with two eyes it it that follow your mouse around the screen. Note the ampersand at the end of the command. This tells the Linux shell to move the xeyes process to the background, allowing the shell to return a prompt for the next thing you want to run. If you don’t include it, you’ll need to close xeyes before you can run something else. Windows users don’t need to feel left out, either, as there’s a number of X server implementations for Windows, such as XMing, Cygwin/X, and XWin32 (commercial). The advantage of X11 forwarding is that it’s already built in to the Raspbian OS and doesn’t require a lot of work to set up. The downsides are that you need to know the name of the programs you want to run, since you don’t have the GUI menu bar to select from and that it can be a little tricky to get working on the client desktop, especially if that machine runs Windows. This will open the Raspberry PI menu bar on your local screen so you can easily launch programs, but it won’t create a windowed version of the Pi desktop as you might expect, but instead becomes a weird mix of your local desktop and the remote desktop that’s confusing and difficult to use. Some X servers have an option to switch to a windowed mode, but if you want the windowed interface without a lot of fuss, you may want to consider another option, such as one of the ones below. VNC, which stands for Virtual Network Computing, is a graphical desktop sharing protocol that was developed by a partnership with Olivetti, Oracle, and later AT&T in the late 1990’s. Since the code for the protocol was open sourced, many different clients and servers have been developed for nearly every platform you might encounter. There are plenty of tutorials for getting VNC running on a Raspberry Pi, so I won’t spend time on that here. If you want to try it, this tutorial on the Raspberry Pi site will get you going. You’ll also probably need to install a VNC client on your desktop—TightVNC seems to be one of the more popular choices, as are RealVNC (from the original developers of the protocol), UltraVNC (Windows only), and Chicken (formerly Chicken of the VNC, Mac only). Mac users take note: there’s already a VNC client built in to OS X—it’s called “Screen Sharing.app.” It’s buried pretty deep in the system, so you won’t find it in your Applications folder, but it should come up in a Spotlight search. The problem with VNC is that its underlying Frame Buffer Protocol sends entire copies of the remote screen to the client, even if only a small portion of the screen has changed, which means it can feel extremely sluggish, even when doing simple tasks, like editing a document. Chrome Remote Desktop is a remote access solution created by Google and available through the Chrome browser via Chrome Web Store. Rather than connecting directly, machines running the Chrome Remote Desktop service register themselves with Google’s servers when they start up, and Google serves as a proxy between the remote machine and the client accessing it, in a way similar to how instant messaging services work. This allows connecting over the Internet to remote computers that are sitting behind NAT firewalls, which is not possible with any of the other services listed here. I use Chrome Remote Desktop regularly to access the Mac Pro in my office when I need to work remotely. The service uses SSL encryption to ensure privacy and Google’s VP8 video format to send the screen image, and it’s very responsive. I have not tried Chrome Remote Desktop on a Raspberry Pi, but others have reported good luck with it on the older Raspbian Wheezy. Unfortunately, Chromium, Chrome’s open source cousin, is not available in the new Raspbian Jessie repositories (yet? ), so short of building from source, this isn’t an option for me at the moment. Also, since it requires using Chromium to set it up, the Pi needs to be connected to something with a screen, at least initially (or you could configure it with X11 Forwarding). NX is a protocol developed by NoMachine, with client and server implementations for Linux, Mac, and Windows. Prior to version 4, NX was open source software that was tunneled to the client over SSH, so it was extremely easy to get running on a Linux box with very little fuss. Unlike VNC, however, NX uses compression to reduce the transferred data so that connections are responsive, even over slower networks. NX has been my go-to tool for Linux remote access for years, but unfortunately no precompiled versions of it, or any of the open source forks or it, are readily available for the Raspberry Pi, and compiling it from source is tricky given the Pi’s limited resources. Fortunately I discovered XRDP some time ago. If you’re a Windows user, you might be familiar with the Windows Remote Desktop Protocol (RDP), which has been included as part of most Windows distributions since Windows XP. RDP achieves very fast speeds by sending only the portions of the screen that have changed to the client. Because of this, many programs appear almost as responsive remotely as they do when logged in to the machine directly. XRDP is implemented as a hybrid between VNC and RDP. The actual remote control of the machine done in VNC, but data is sent back to the client through RDP, where it can benefit from the efficiencies of that protocol. This helps make XRDP faster than VNC, since much of the VNC overhead is never sent over the wire. RDP is also a widely supported protocol, with clients built in to most Windows computers. – low — Data you send to the server is encrypted with 40-bit RC4 encryption, but the data you receive is sent in the clear. – medium — Data is sent in both directions using 40-bit RC4 encryption. When you connect, you’ll be prompted for your credentials on the Pi. 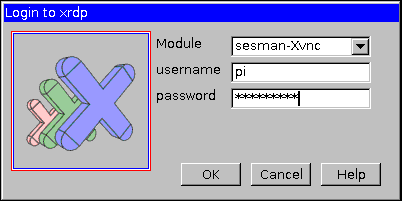 Leave the “module” set to “sesman-Xvnc,” enter your username and password, and click OK. 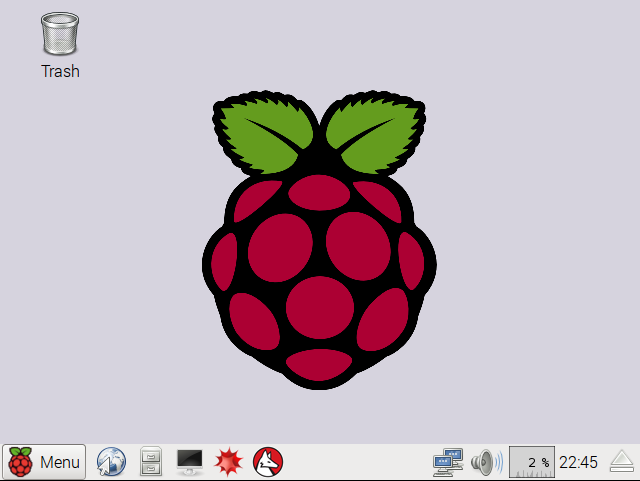 In a few seconds, you should have full access to your Raspberry Pi desktop. Since the DNS servers for the service I’ve been using seemed to vanish a couple weeks ago, I started “shopping” for a new provider and came across dtDNS. dtDNS allows you to set up five dynamic DNS hostnames for free, or you can pay a $5.00 one-time fee to get unlimited (“within reason,” according to the site) hosts. Once I had my new hostname set up, it was time to set up a client app to keep my IP in sync. I had some trouble getting ddclient, which I’ve been using for a while now, to work with dtDNS, and the Linux options on dtDNS’s update clients page were either no longer available, required Java, or expected the machine to have a public IP address, which mine does not. So with a bit of research, I wrote my own. My updater is a simple shell script with less than 10 lines of code. It uses icanhazip.com to find the external IP address, so it will work on systems that don’t have public IPs, and it only pushes a change request when it sees that the IP has changed. The script will return whatever response it receives from the dtDNS update API, whether it is an error or success message. If nothing is returned it means that dtDNS already has the correct IP, so no action was taken. This will run the script once every five minutes. You can adjust the interval as you feel is appropriate. Once you save the file, the new cron job will be installed and will begin running within a few minutes. Now you can rest assured that your IP address will always be up to date with dtDNS. Protip: If your dtDNS hostname is too difficult to easily remember and you own a domain name, you can set up a hostname on your own domain that points to your dtDNS name. If you maintain your own DNS, create a CNAME record for whatever host name you want with your dtDNS hostname as the target. If you don’t maintain your DNS yourself, ask you host if they can configure this for you.